Understanding the different parts of our eye can help you understand how you see and what you can do to help keep the eye functioning properly. The eye is one of the most complex parts of the body. The different parts of the eye allow the body to take in light and perceive objects around us in the proper color, detail and depth. This allows people to make more informed decisions about their environment. If a portion of the eye becomes damaged, you may not be able to see effectively, or lose your vision all together. What are the parts ? Which part is not function properly when we suffer different vision problems like myopia and glaucoma? Which part produces tears? There are several physical and chemical elements that make up the eye. The eye is also heavily involved with the nervous system, which allows the brain to take in information from the eyes and make the appropriate decisions on how to act upon this information. The nerves must be kept in prime condition or the brain may start to receive false images, or you will not take in enough information to get an accurate perception of your environment. The cornea is the outer covering of the eye. This dome-shaped layer protects your eye from elements that could cause damage to the inner parts of the eye. There are several layers of the cornea, creating a tough layer that provides additional protection. These layers regenerate very quickly, helping the eye to eliminate damage more easily. The cornea also allows the eye to properly focus on light more effectively. Those who are having trouble focusing their eyes properly can have their corneas surgically reshaped to eliminate this problem. The sclera is commonly referred to as the "whites" of the eye. This is a smooth, white layer on the outside, but the inside is brown and contains grooves that help the tendons of the eye attach properly. The sclera provides structure and safety for the inner workings of the eye, but is also flexible so that the eye can move to seek out objects as necessary. The pupil appears as a black dot in the middle of the eye. This black area is actually a hole that takes in light so the eye can focus on the objects in front of it. The iris is the area of the eye that contains the pigment which gives the eye its color. This area surrounds the pupil, and uses the dilator pupillae muscles to widen or close the pupil. This allows the eye to take in more or less light depending on how bright it is around you. If it is too bright, the iris will shrink the pupil so that they eye can focus more effectively. These are layers of mucus which help keep the outside of the eye moist. If the eye dries out it can become itchy and painful. This part of eye can also become more susceptible to damage or infection. If the conjunctiva glands become infected the patient will develop "pink eye." These glands are located on the outer corner of each eye. They produce tears which help moisten the eye when it becomes dry, and flush out particles which irritate the eye. As tears flush out potentially dangerous irritants, it becomes easier to focus properly. The lens sits directly behind the pupil. This is a clear layer that focuses the light the pupil takes in. It is held in place by the ciliary muscles, which allow the lens to change shape depending on the amount of light that hits it so it can be properly focused. The light focuses by the lens will be transmitted onto the retina. This is made of rods and cones arranged in layers, which will transmit light into chemicals and electrical pulses. The retina is located in the back of the eye, and is connected to the optic nerves that will transmit the images the eye sees to the brain so they can be interpreted. The back of the retina, known as the macula, will help interpret the details of the object the eye is working to interpret. The center of the macula, known as the fova will increase the detail of these images to a perceivable point. Ciliary body is a ring-shaped tissue which holds and controls the movement of the eye lens, and thus, it helps to control the shape of the lens. 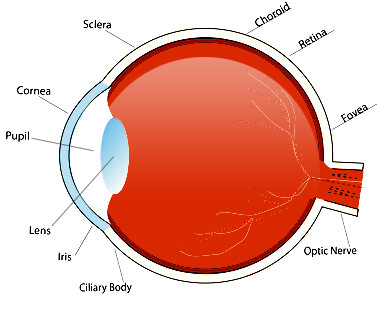 The choroid lies between the retina and the sclera, which provides blood supply to the eye. Just like any other portion of the body, the blood supply gives nutrition to the various parts of the eye. The vitreous humor is the gel located in the back of the eye which helps it hold its shape. This gel takes in nutrients from the ciliary body, aqueous humor and the retinal vessels so the eye can remain healthy. When debris finds its way into the vitreous humor, it causes the eye to perceive "floaters," or spots that move across the vision area that cannot be attributed to objects in the environment. The aqueous humor is a watery substance that fills the eye. It is split into two chambers. The anterior chamber is located in front of the iris, and the posterior chamber is directly behind it. These layers allow the eye to maintain its shape. This liquid is drained through the Schlemm canal so that any buildup in the eye can be removed. If the patient's aqueous humor is not draining properly, they can develop glaucoma. Hope the above chart helps you understand the parts of the eye and their functions more clearly.